I don’t know about you but I like trying new stitches. I found a three-color stitch in my favorite crochet book* that I decided would make the basis of a great potholder. 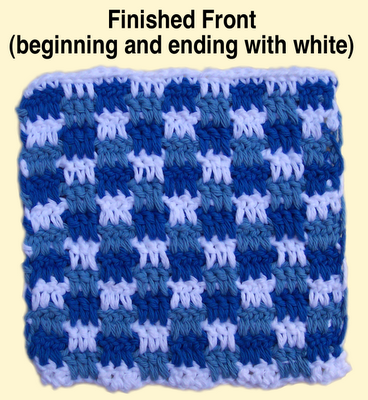 The book uses three very different colors but I thought by using two colors in the same family (example, light blue and medium blue) with white, the stitch would resemble gingham. With that thought, a new potholder pattern began to come to life. 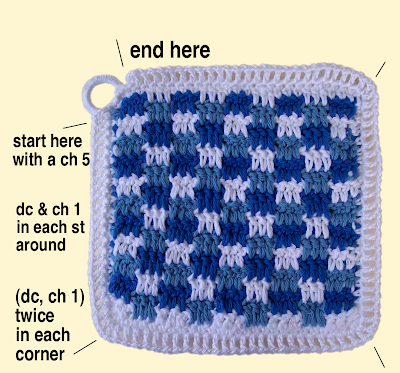 The purpose of this blog post is to share this new potholder pattern with you. 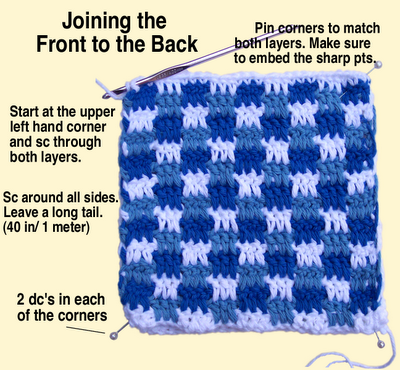 You can follow the information with step-by-step photos to make your potholder with ease. Once the basic gingham potholder is joined with the back, you may find it could use a little bit of jazzing up to complete it. 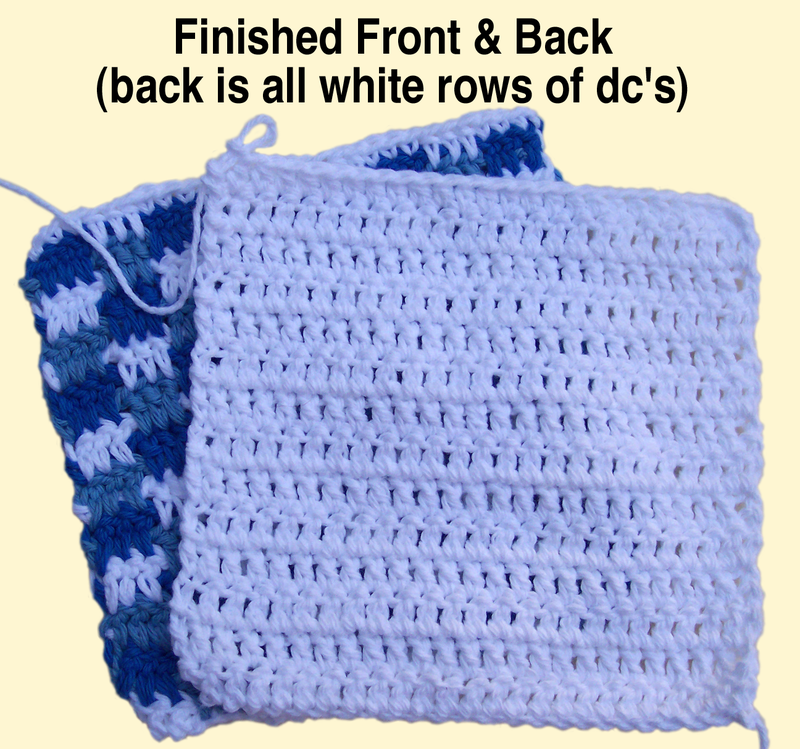 By crocheting a thinner white edging, weaving in some grosgrain ribbon between the posts, and finally attaching a little daisy in the upper corner, you will be very satisfied with your new, fun and fresh potholder. You are welcome to make, share or sell as many of these potholders as you like. However, please refrain from claiming the pattern as your own or selling the pattern. Copyright 2011, C. Lowman. All Rights Reserved. This stitch looks more difficult to execute than it really is. Once you get through the first few rows, you won’t even need to refer to the directions until you reach the last row. The only real challenge is keeping three balls (or skeins) of yarn from getting tangled because you will be working one of three colors on each row and then picking up the waiting color at the other end. 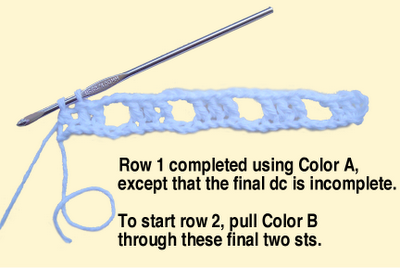 In other words, you won’t cut off your yarn until you are done with the three-color front. *I want to mention my favorite crochet stitch book right now before going further. 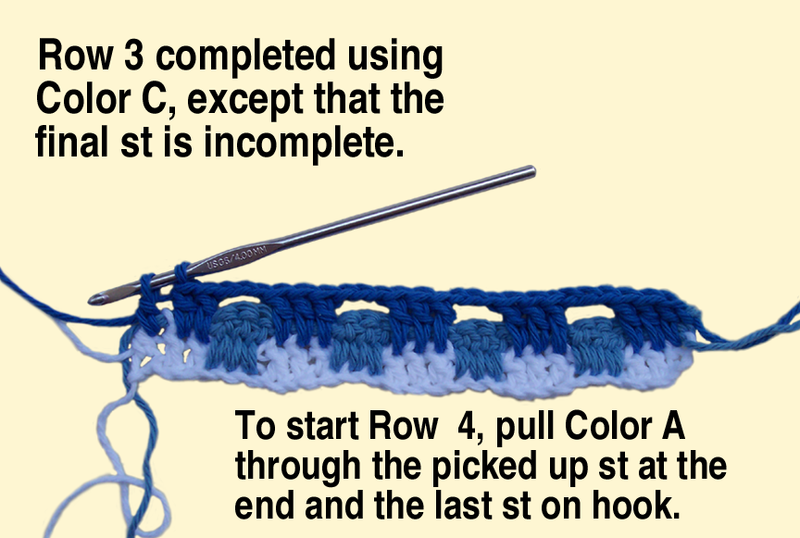 It is called The Complete Photo Guide to Crochet. The author is Margaret Hubert. 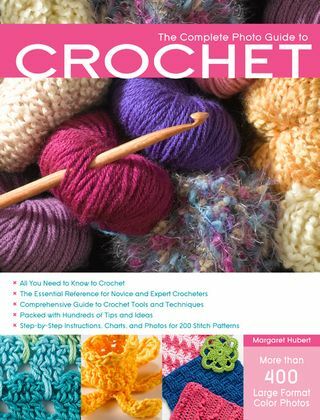 I highly recommend this book for learning new stitches to inspire you in your work. 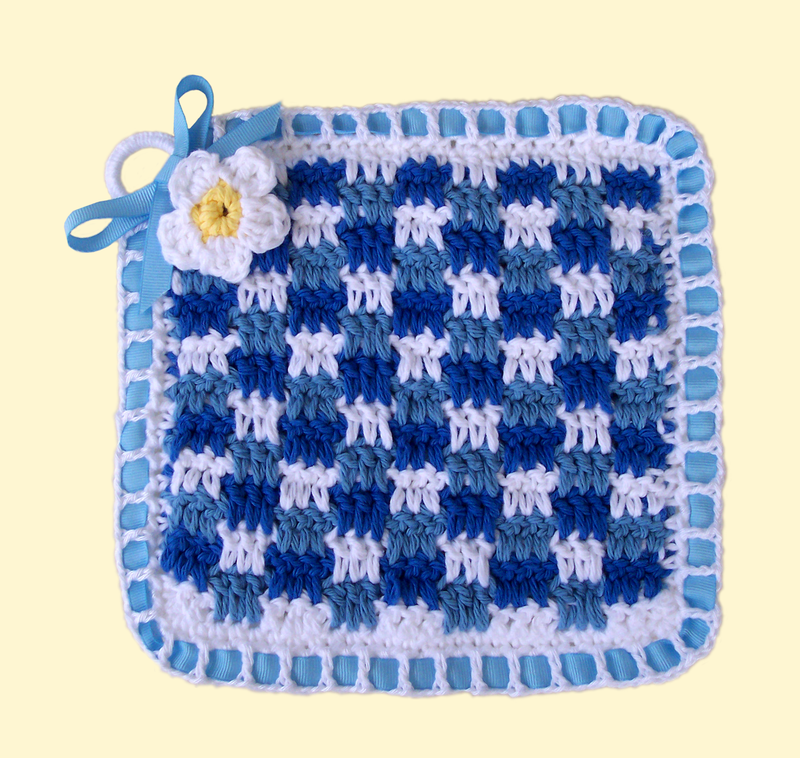 a Gingham and Daisy potholder. A. Hook: sizes G (4mm) or H (5mm) and a smaller hook, size F (3.75mm). 1. Thicker (worsted weight cotton): White and two shades of the same color (one lighter, one darker) of heavier cotton, such as Lily’s Sugar ‘n Cream, Pisgah’s Peaches & Crème or Lion Brand cotton. Don’t forget you will need just a little bit of yellow for the center of the daisy, too. 2. Thinner: This thinner white is for the edging. 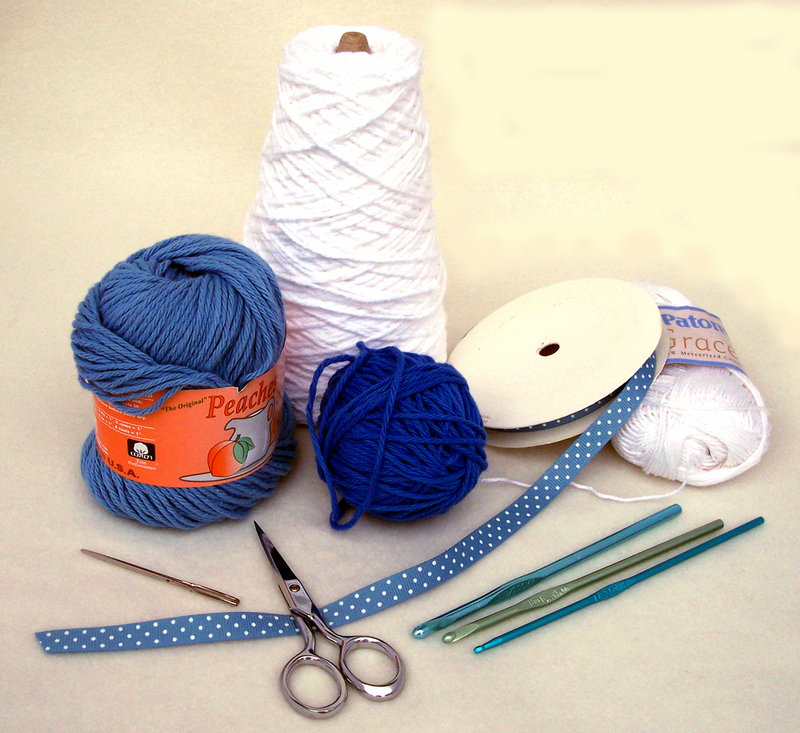 Use a yarn such as Patons Grace, J&P Coats Royale Fashion Crochet thread size 3, or something that is also thinner. Perhaps pabilo from South America. I am using Patons Grace because it is soft, slightly shiny and very flexible. C. About 42 inches (1 meter plus 3 mm) inches of 3/8-inch (10 mm) grosgrain ribbon in a coordinating color for each potholder. D. Optional: plastic or metal ring* for potholder hanger. *I use steel 1–inch rings (2.5mm) that I purchase in a package in the jewelry/bead department at a fabric or craft store. Normally you would use these split rings for key chains but I find they are perfect for potholder hangers. I like the size and can buy 48 in a package for a very small amount of money. Establishing gauge is not necessary for this project. For most people I would recommend the G hook. I have used both the G and H hooks successfully on this project but I liked the final size of the potholders I made using the G hook. I thought the two I made with the H hook were a little large and, as a result, I did not add on the edging and grosgrain ribbon. This potholder has a front and a back. The front resembles gingham fabric using two colors with white. The backside is all white. The two layers together make this potholder extra thick and ideal for handling hot pans and dishes. 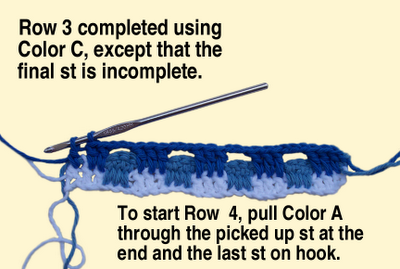 Row 1: Color A. dc into the 4th st from the hook. By doing so you will already have 2 dc's completed because the last ch stitches from the foundation row make up the first dc of this row and the actual dc into the 4th st is the second dc. Then dc in the next st for a total of three dc's. Next *(ch 3, skip next 3 sts and dc into the 4th st, dc into the next 2 sts) Repeat from *across row ending in three dc’s. Instead of completing the last dc, start color B by drawing through the last 2 loops of Color A to complete the dc. Let color A drop. DO NOT BREAK OFF. (You will pick up color A again in row 4.) Turn. Row 2: Color B. ch 3, skip three sts and, now working over the chain and down into the stitches below the open space, *(dc in the top of the first ch st below [for this row only, do not dc into two sts, just work into the chain st], dc in the tops of the next 2 ch sts in the open space, ch 3) repeat from * to the end of the row. You will end with a ch 3. When poking your hook into the last dc from the previous row, draw Color C through this poke and through the last ch. Drop Color B. (You will pick up color B again in row 5.) Turn. Row 3: Color C. ch 1 *(dc in next three dc sts below the open space, ch 3). Repeat this sequence from * across. You will end with a dc. Draw color A through the last 2 loops of your unfinished dc. Drop color C. Turn. About now you might want to detangle your colors. Do this periodically. Row 5: Color B. ch 1 *(dc in the next three dc sts below in the open space, ch 3.) Repeat this sequence from * to the end. You will end with a dc. Draw up Color C through the last two loops on your final dc. Drop Color B. Most likely you have mastered the sequence of the rows and colors. Continue building rows until your “gingham” measures almost the same in height as the width. You will do one last short row to complete the front. Note: I prefer to start and end with white. Last row: With Color A, ch 1, *(sc in next 3 sts, hdc in tops of the next three sts of the open space) repeat from * across. End with 3 sc’s. Break off all three yarn colors. Secure all yarn ends in the back. 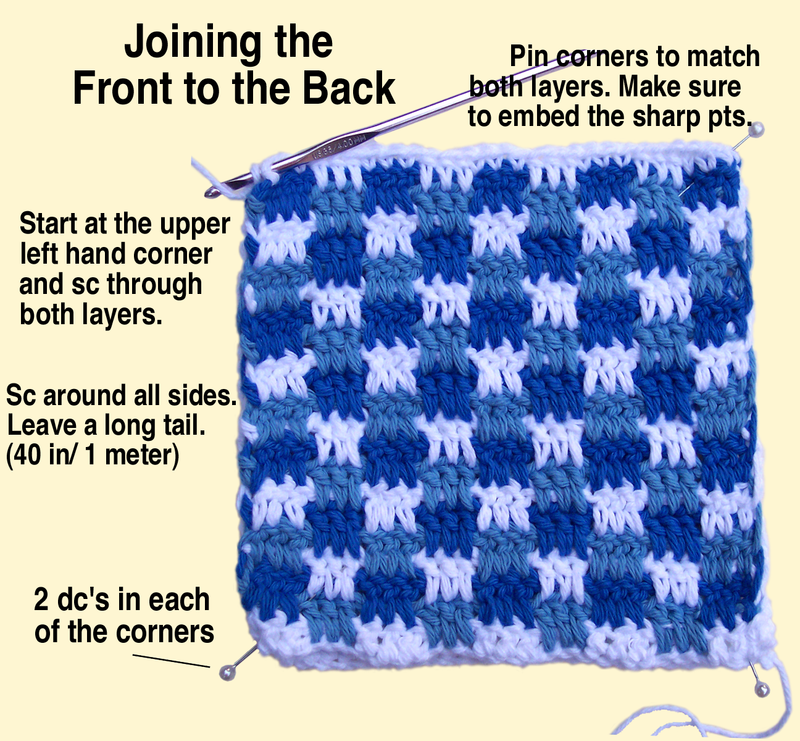 The back of the potholder is simple. It is all-white rows of dc’s. Foundation row: ch. 27 sts. Row 2: and all rows until the piece measures the same as the front (gingham) side: dc across, ch 2, turn. Do not cut your yarn. You will continue on with the white to join the front and back sides together with sc’s. — If you haven’t already, now is the time to secure all yarn ends on the backs of the two layers. Do this before joining them together. — Position your plain back (Color A, white) so that the attached yarn is at the upper left hand corner. Place the gingham right way up on top of it and match the corners of the gingham front to the corners of the all-white back. — With large straight pins (I use corsage pins) secure the corners through both pieces, making sure to tuck in the sharp ends so they will not poke you as you sc around. — With the gingham side facing you, sc through both layers starting at the side and going down. 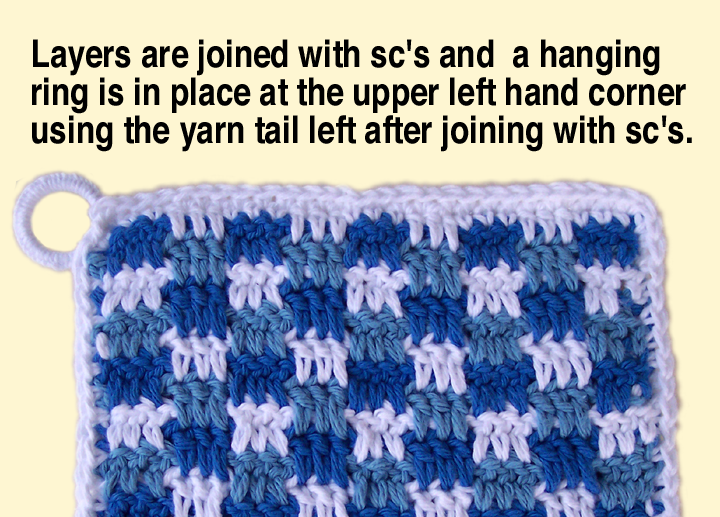 You will make 2 sc’s into each dc on the sides (going through both layers) and 1 sc into each stitch at the top and bottom. Remove straight pins (or corsage pins) as you come to them. Crochet 2 sc’s into the corner st on all four corners. 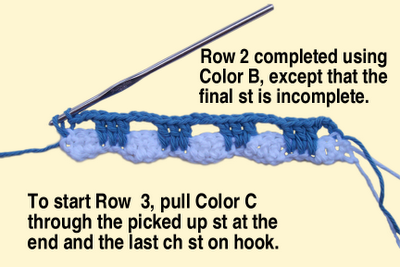 Sl st to beginning st.
— If you intend to crochet a loop, rather than attach a ring, then there is no need to cut the yarn until you are done with your loop. If you are going to do a blanket st around a plastic or metal ring, leave a four foot (1 and ½ meter) yarn tail to finish your ring. Finish your loop or ring before continuing and secure your loose yarn ends. Ch 5, dc into next st, *(ch 1, dc in the next st) repeat from * around until you reach your first corner. ch1, dc twice into the corner st. Continue *(ch 1, dc in the next st) repeat from * around until you reach your second corner. ch1, dc twice into that corner and repeat this pattern with the third corner. Continue wit your ch 1, dc sequence until you reach. ½” (1.5 mm) from the final corner where you began. It may seem like your posts for the edging are very close together but remember that you are going to weave your ribbon in and out so that only every other one of these posts is in the front. The spacing will look wider on both the front and back after your ribbon is in place. Break off yarn and secure the ends. Note: If you are using grosgrain ribbon that is wider than suggested, you may have to make your edging posts longer, perhaps a tc, instead of a dc. Using your blunt nosed tapestry needle, thread your ribbon and weave in and out of the edging posts starting at the upper left hand corner. Weave a few inches at a time and stop to make the ribbon lie flat without any twists. Complete your weaving around. Position the ribbon so that you have enough left over at each end —at least 7 inches (18 mm) for making a bow. Take a little time to pretty up the ribbon so that it looks just right on your edging and is neither too tight or too loose. The bow: I wish I had a great way to explain how to tie a perfect bow. I don’t. I play with it a few times until I get it to look okay. Usually I wind up tying the bow with the potholder ring closest to me and the rest of the potholder further away. This seems to ensure that the ends will be below the bow and not up by the ring. Just play around with your bow until you get it the way you want it. Then cut the excess ends on a diagonal. I like to use fabric glue dabbed on the very ends so they won’t fray. Secure the bow to the gingham by hand tacking it place to secure it. Try to make your stitches as invisible as possible. The daisy is easy and comes from a book. (See photo on the right.) 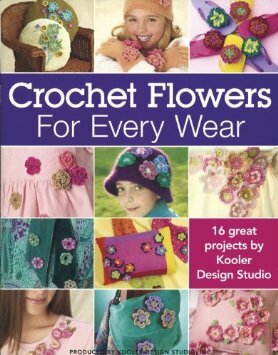 I am offering the directions for a 5–petal flower from Crochet Flowers for Every Wear by Kooler Design Studio, Inc., page 27. My added notes are in brackets. [Using yellow for the daisy center], ch 5 and join with a sl st in beg ch to form ring. Rnd 1: 5 sc into ring and join with sl st in beg sc. Rnd 2: [Break off yellow and start white] *(sl 1, ch2, 2 dc, ch 2, sl 1) in next sc; repeat from * around ending with a sl st in beg st—5 petals. And, I have a brand NEW SHOP!!! 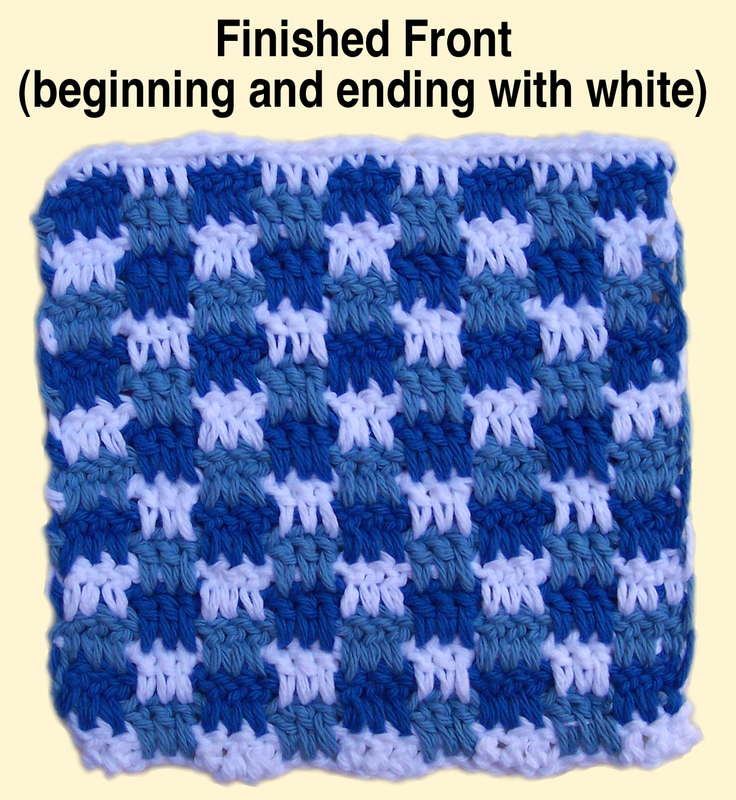 I think I have crochet this stitch before but I will probably try it again. Thanks for the pattern. 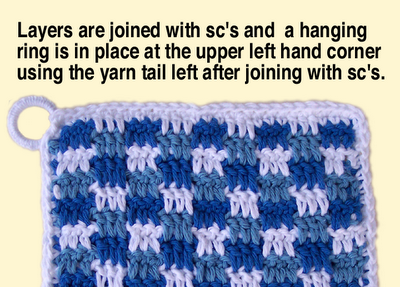 What lovely potholders and how lovely of you to share such a wonderful tutorial. You make a complicated look so easy. Thank you. Have a wonderful weekend. PRECIOUS!!! What ADORABLE potholders. Thanks a lot for the pattern!!! This last post is in Turkish. I had to go to google translator to learn the meaning. The translation is that the crocheted hand work is beautiful. It literally translated to "weave" instead of crochet, however. Thanks to everyone for taking the time to share such positive remarks. Stopping by from Suzy's Artsy Craftsy Sitcom link party. These are super cute! If I had the time to learn to crochet, I would just so I could make these! I think I will have to put them on my crafting bucket list. Have a great day! Thank you for the great pattern! 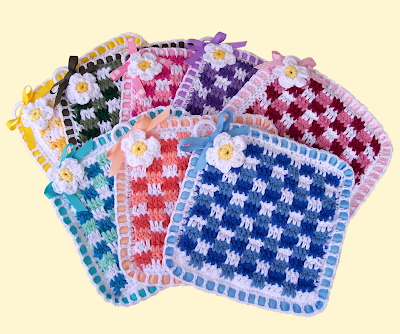 It's pleasure to make and use such potholders! I too love the book you mentioned in the beginning. I took mine to and office supply store and had them make it into a ringed book. Now it opens nicely and the reinforced the front and back covers too.